several modern agricultural practices such as increased irrigation coverage and no-till farming may reduce the effect of global warming, claims a recent study. But climate change models have failed to take into account these positive aspects of agriculture, say climate scientists from the Lawrence Livermore National Laboratory (llnl) in the us. "Nearly all models used to predict climate changes either ignore agriculture altogether or assume that farmers behave the same way through time," said David Lobell, the lead author of a paper that appeared in Geophysical Research Letters (Vol 33, No 6, March 23, 2006). "In reality, farmers are changing rapidly in response to new technologies, growth in demand and other factors. This study suggests that these changes may have important cooling effects, especially at local scales." Over the last 50 years, area under cultivation has increased by just 10 per cent. But farmers have doubled irrigated areas, more than doubled the crop yields, and have increased the number of crops grown in a field per year. More crops means more sunlight is reflected. A recent trend toward less frequent ploughing of fields also has raised the reflectivity, or albedo, of the earth's surface, the scientists say. 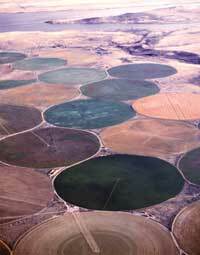 The llnl team, which included India-born scientist Govindasamy Bala, simulated that doubling of irrigation alone would have resulted in a local temperature drop of 8 c. Irrigation cools the surface by increasing the amount of energy used to evaporate water rather than heat the land. Taken globally, this temperature difference would have been 1.3 c. Similarly, reduced tilling is found to have a global cooling effect of 0.2 c. The authors, however, cautioned that the changes in the model were extreme, and effects in the real world may be smaller. The study indicates that climate mitigation policies, which often include incentives to farmers, may be too simplistic. Most proposed climate policies focus only on the ability of farmers to sequester carbon in soils or reduce on-farm energy use. "This study illustrates that carbon is not the only important way that agriculture affects climate, and so focusing only on carbon may lead to an under- or over-evaluation of agriculture's role," Lobell said.